The Anatomy of Riches tells the story of one family’s long rise from rags to riches, and their rapid reversal of fortune. 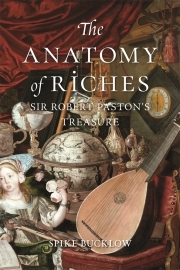 It focuses on the life of Sir Robert Paston, who experienced the family’s fall from grace at a time of momentous change, the beginning of the modern world. The Paston wealth had brought luxuries from across the globe to an idyllic retreat in rural Norfolk. The family commissioned Europe’s finest craftsmen to enhance their rarities, and their lavish hospitality was famed throughout England. But the Civil War and plague tore the country apart, and peace-loving Sir Robert was assailed by what he called a ‘whirlpool of misadventures’, although he kept his faith and worked tirelessly to protect his wife and children. Encouraged by his friend Dr Thomas Browne, he even found time to pursue his interests, employing both an alchemist in search of the Philosophers’ Stone and an artist to capture his favourite treasures in an enigmatic still-life, The Paston Treasure. in its complex imagery and the many materials from which it was composed. which it desired, studied, collected and brought to life. Spike Bucklow is Reader of Material Culture at the University of Cambridge. His publications include The Alchemy of Paint (2009), The Riddle of the Image (Reaktion, 2014), which won the ACE/Mercers’ International Book Award 2015, and Red: The Art and Science of a Colour (Reaktion, 2016) which was placed on Choice magazine's 2017 list of Outstanding Academic Titles.